DUSHANBE (Asia-Plus) – Specialists from the Ministry of Economic Development and Trade (MoEDT) say Iranian companies are expected to establish the first specialized industrial city in Tajikistan. Industrial park Industrial techno-park, Almaty. An industrial park (also known as industrial estate, trading estate) is an area zoned and planned for the purpose of industrial development. A more “lightweight” version is the business park or office park, which has offices and light industry, rather than heavy industry. Industrial parks are usually located outside the main residential area of a city and normally provided with good transportation access, including road and rail. Industrial parks are usually located close to transport facilities, especially where more than one transport modes coincide: highways, railroads, airports, and ports. This issue was discussed at a three-day conference entitled Conditions for Iran’s Investment in Tajikistan that was held in Dushanbe on February 22. 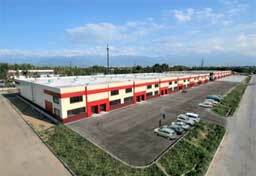 The Government of Tajikistan will allot 100 hectares for the establishment of the industrial district. The construction of the specialized city will be launched after detailed consideration of documentation and it is expected to be finished in three years after construction begins. Speaking at the conference, Deputy Minister of Economic Development and Trade, Homidullo Fakerov, noted on February 22 that Iran is Tajikistan’s third trade partner after the Russian Federation and China. Over the past decade, a two-way trade between Tajikistan and Iran has risen 50% and it valued at US $215 dollars, the deputy minister said. According to him, Iran’s investment in sector like industry, energy, education and culture has increased in recent years. A meeting of Tajik and Iranian businesspeople will take place in Dushanbe on sidelines of the conference that is concluding tomorrow. Meanwhile, Iran’s news agency, IRNA, quoted Tajik Ambassador to Iran Davlatali Hotamov as saying in Orumiyeh, West Azerbaijan Province on February 13 that cultural and historical commonalities shared by the two countries have paved the way for promotion of bilateral cooperation. Hotamov visited Orumiyeh to get acquainted with several agricultural and industrial projects in this north-western Iranian province and meet local officials. Tajik diplomat referred to Iran as Tajikistan’s fifth trade partner, adding that bilateral trade exchanges reached $254 million last year. More than 200 Iranian companies are active in Tajikistan’s various development projects, including construction of tunnels and hydropower plants.